Five Awesome HASS Resources You Need To Include In Your Planning. No doubt you’ve been flat out since school started! The start of the year is a really exciting time but it can also be exhausting. There’s so much to do! Set up your room, prep stationery, make labels, clean and most importantly PLAN! I’m one of those weird people that love to plan! #inserteyeroll However, I’ve changed my planning strategy over the last 2 years, particularly when it comes to the HASS component of the Australian Curriculum. I used to write my HASS plan and then look for resources and assessment ideas to suit my plan. This worked well – some of the time. It was great if I could find appropriate resources, but was a nightmare if I couldn’t find any and had to make them myself. Mostly it was just mind numbing worksheets from a book, that all looked the same and the students hated. That struggle was really the catalyst for Aussie Star Resources. I wanted to be able to find HASS resources that were specific to my needs and the curriculum I was teaching. Now I approach planning differently. I actually start off with a search of Teachers Pay Teachers, Pinterest and good ol’ Google, to see what resources are available that meet my HASS topics and are appropriate for my lessons. Then I plan and write my lessons based on these resources. I feel far more prepared and I feel that the lessons are more engaging because I’m not trying to fit the resource in to my original plan. If I do need to make some resources, it’s far less than what I have had to make in the past. I’ve also used resources I’ve found for assessment tasks, which makes preparation and marking even easier. So, here are five HASS resources you should consider adding to your HASS plan. These resources are a great sample of the many resources fantastic Aussie Teacher Authors are creating. Be sure to check out their stores – it’ll save you loads of resource creation time and let you get on with the things you really want to do. You can quickly access their stores by clicking on the title. Nuala O’Hanlon is a veteran teacher, lyricist, and a full writer member of APRA AMCOS. Her experience includes work in mainstream, open-plan, independent progressive, pre-school, ESL, special needs, and music classrooms. She has worked as a development and training officer in a hospital setting, and a camp counsellor (Ages 7-14). Nuala has a background in the Creative and Performing Arts. Nuala’s colleague, Kathryn Radloff, is an Arts (Hons) Psych. graduate with a Creative Arts Diploma. Kathryn has worked in the area of social justice and advocacy. In addition, she has implemented social skills and behaviour modification programs for students with significant behavioural and learning difficulties. A singer/songwriter in her own right, Kathryn has a background in the creative & performing arts, social work & Psychology. 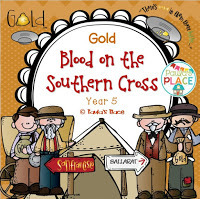 This great resource has been created for Middle/Upper Primary students. 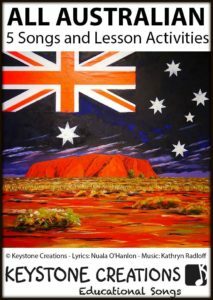 It contains 5, Australian-specific, curriculum-aligned songs & lesson materials that target outcomes & learning sequences of curriculum documents. Also, they integrate learning across key subject areas. 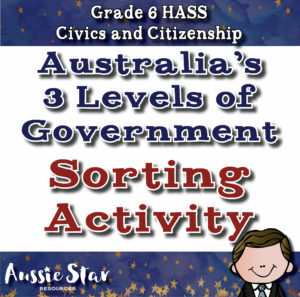 The content covers Australia, the Gold Rush, key people and events leading up to Australian Democracy, the government’s 9 values for Australian schools, and the Australian version of our song, ‘Healthy Kids’. There’s ‘A Lesson In Every Lyric’®. The Creative Teacherpreneur behind Galarious Goods is a Queensland middle grades teacher with an Ancient History, History and Government background. Her store offers comprehensive resources to help get students enthusiastic about HASS. This resource bundle has been designed for Year 6 students and up. It meets the content requirements for Civics and Citizenship – Elections and Electoral Systems. 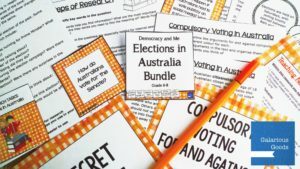 The advantage of this bundle is that it can be used as a complete unit, for small group work or to complement other election resources. Bundles are a great way to buy resources! You have everything you need in one file and they are usually generously discounted. Paula is the inspired author of Paula’s Place. Paula has been teaching for 32 years and loves that each day is different. Her store caters for K-6 Grades. This year she is back teaching 5/6 and has taken on the role of Leading Teacher for Maths and Digital Technology. She loves sharing her teaching and learning space with others. How to get hold of gold – Gold towns, what tools do we use? This creative Resource Developer has been teaching for the last 12 years, all grades from K to 7. Although, for the last 8 years she has been a Year 6/7 teacher. She really enjoys teaching and loves to travel in her spare time. This project has students researching Australian federation, life in 20th century Australia and an Iconic figure. It has been designed to tie in with the Australian Curriculum Year 6. 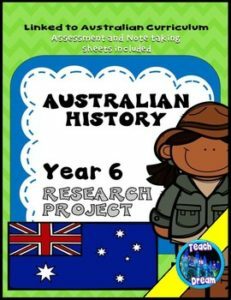 But it could be modified to meet Year 5 standards or for any class completing research on Australia. It includes key websites to help students start their research, Assessment rubric, bibliography and note taking sheets and Australian Curriculum standards. Everything you need is supplied — it’s pretty much print ‘n go! Yes I know it’s a bit cheeky putting my own store on here but I love to share! When I first looked at the Year 6 Australian Curriculum topics I wanted to cry. They seemed so DULL! I found teaching them mind numbingly boring. It wasn’t until I went to Canberra with my class on camp that I really upped my game when teaching HASS. I became determined to ensure the students were aware of our political history. Ince 2016 I’ve been working in other areas of education that work around our family, but I’m looking forward to getting back into the classroom next year. ★ Why does Australia have three levels of Government? I hope you’ve found these helpful! I love this video about Australia’s federation. Like some of our wonderful cricketers, I think many Australians are not aware of the name of our first Prime Minister. I remember learning it in Year 12 legal studies, but if I hadn’t completed this subject I may not have known for a long time – or ever! In the past Australia’s political history has not been a major topic and therefore we’ve grown up somewhat ignorant of how Australia’s federation came about and the impact this has had on our society since then. With a national curriculum in place, this will no longer be an issue. Some of the best sellers at our store are our Australian Federation resources. This topic is in the Year 6 Australian Curriculum (ACHASSK134) and while it is important, it can be a little bit… how shall I put this… dull. Federation may be potentially boring but it’s also extremely important. Australia’s move to federation looks remarkably civilised; it was achieved without civil war or great protest. The first year I taught it, I found it very dry. I felt like I was just giving dates and names to remember, without any connection to the country we live in today. My students found it incredibly boring too, but I just couldn’t think of a way to “rev it up”. Then we went on our first camp to Canberra. I was amazed and proud to see the knowledge they had gained come to life as we visited old and new Parliament House, the National Archives and the National Capital Exhibition. I came home from camp with a whole new attitude towards this subject. And I was determined to make it more engaging for students so they understand and appreciate our history and can share it with others. 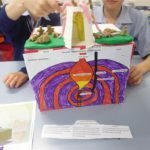 One way I’ve endeavoured to make this topic more interesting is by using resources that are not your standard worksheet, we have resources that require internet research, craft activities and creativity and the feedback has been fantastic. Henry Parkes and Edmund Barton can be interesting if the task requires more than just filling in the blank spaces. And studying timelines is not just putting numbers in boxes to order events. I’ve found that students who complete our resources feel a sense of pride that they have created something that looks great and is a fun way to show their learning. They actually like to share their work with their peers and parents! We’re regularly adding new products to our range and try to keep product cost to a very reasonable amount (most individual items are less than a cup of coffee). If you’re looking for ways to engage students with Australian Federation then head over to our store. Are you teaching Australian Federation this year? If you haven’t taught the Year 6 curriculum before, you may need to update your personal knowledge about this topic before planning and teaching your unit. This blog post will focus on the reasons for and against federation and how these can be addressed in a way that students can understand. I’ve set this out similar to a lesson plan to make it easy to read and you can print it off as a reference. Because I just can’t help myself! To provide teachers with information and resources to help teach this topic with maximum student engagement. By the mid 1800’s Britain had established six colonies in Australia: New South Wales, Victoria, Queensland, South Australia, Western Australia and Tasmania. Each colony operated independently and was governed by its own parliament, but ultimate control remained with the British Parliament, which had final approval of any laws. Each colony held responsibility for its own defence, customs, immigration, trade, taxation and transport. By the 1880s there was growing frustration with inefficiencies caused by the separate colonies. As the number of Australian born citizens grew, so did the sense of national identity. Here are the major issues that motivated the move to federation. Some colonies charged import/export tariffs and had immigration officers search luggage at train stations. Some people believed that allowing free trade between the colonies would strengthen the economy. Each colony had its own policies regarding trade and were concerned with protecting local industry from overseas and interstate competition. Expensive tariffs and taxes made travel difficult between the colonies. Some states even had immigration officers search travelers’ luggage at train stations. Additionally, each state built railways using different gauges. That made travel and transport of goods difficult across our large continent, as passengers needed to be transferred from one train to another at state borders. Many people argued that federation would allow for free trade between the colonies, which would make the economy stronger. Each colony had its own, poorly equipped militia made up of a small number of permanent members and volunteers. The colonies would have to rely on the British defence forces to protect them but they were so far away! The colonies had small, poorly equipped defence forces, which made them more vulnerable than the larger colonies. Especially, they relied on occasional patrols of the British Navy to protect the enormous Australian coastline. There were also concerns about Germany and France — who had established colonies in the nearby Pacific Islands and were considered a serious threat of invasion. Nearby Asian countries, Japan and China, were also considered a possible threat. It was believed that creating a single defence force for the nation would allow for better protection. While there was a desire to be one nation there was also a strong desire to keep the British legacy. There were concerns that cheap labor could create competition for colonists, as they were cheaper to employ. There was still some resentment of Chinese migrants following the Gold Rush. In the late 1800’s there was a growing sense of identity within the Australian colonies, which helped the argument for federation. However, while people saw themselves as distinctly Australian, there was also the desire to continue the British legacy. There were concerns of migrants working as cheap labor. Competition for work with colonists would lower wages, which would lead to a reduced standard of living. These concerns were partly fueled by resentment towards immigrants following the Gold Rush. During that time, a large number of Chinese immigrants came to work on the gold fields. There was also concern in Queensland. Resentment was growing towards the Pacific Islanders who worked in the sugar plantations for low wages, taking away work from colonists. There were an increasing number of Australian born colonists who didn’t feel ‘British’ and saw themselves as uniquely Australian. Troops fought in the Boer War in South Africa as Australians, increasing the sense of national pride. By the 1880’s there was a growing sense of national identity within the colonies, as the population of Australian born citizens increased. The Australian born citizens didn’t feel the same loyalty to England as their parents and grandparents. They considered themselves uniquely Australian and felt that they should be governed by Australians. Australians had fought in the Boer War in South Africa, which strengthened the sense of national pride. While there was growing support for federation, there were also concerns within the colonies which created a lot of debate. As NSW and Victoria were the most populated and powerful colonies, there was concern that they would have more control. There were concerns that abolishing the customs duties between the colonies would disadvantage industry in the smaller colonies. Federation would be expensive and having a federal government would be expensive to run, meaning more taxes. The current system was working, so why change it? It would be too hard to get all the colonies to agree to uniform policies for trade, immigration etc. Each colony was unique and had its own identity. There was concern that federation would cause colonies to lose their individuality. Aussie Star Resources have created theHASS Australian History Reasons For and Against Federation activity. 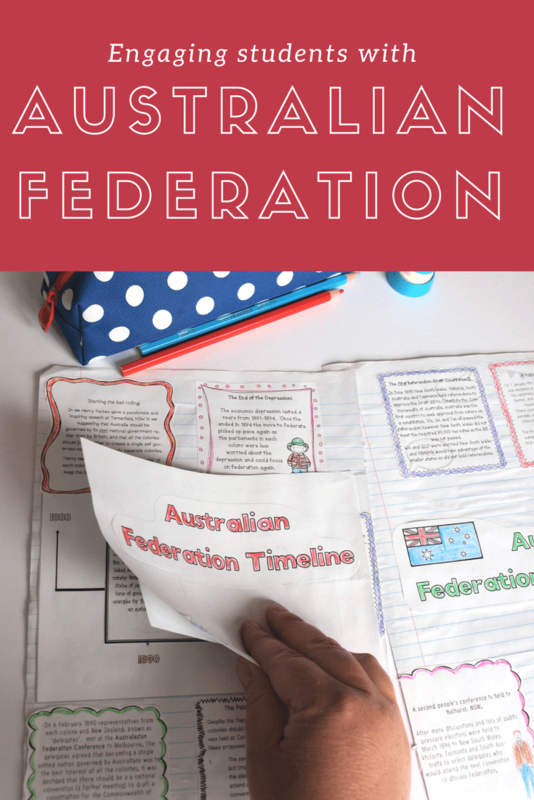 It’s a fun and engaging resource to help your students understand the reasons for and against federation. This simple activity allows students to read through a number of statements and decide if they are in support of federation or against it. I also show this BTN segment which is a great way to introduce the topic of Federation and aligns perfectly with this task. We also complete a W.O.T. analysis as a class after watching the video, discussing the Strengths, Weaknesses, Opportunities and Threats of federation and recording them on the board and in the students’ workbooks. You can feel confident that your students will have a good understanding of the arguments for and against federation after this lesson. 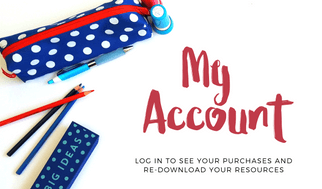 Check out our Teachers Pay Teachers store to access our fantastic range of Australian Federation Teaching Resources. My favourite Science unit to teach is definitely Earth Sciences. Studying earthquakes, volcanoes and tsunamis is exciting! Students love to learn about how these amazing natural phenomena are caused and what effects they can have. In Australia we occasionally have some minor tremors and our volcanoes are all extinct. Mind you, however, on our last family trip to Mt Gambier, I did feel a fleeting moment of panic at the thought that the experts might be wrong… At any moment the Blue Lake might not be quite so tranquil! Are you teaching Earth Sciences this term? If you are, check out some helpful ideas and websites that can make your unit even more hands-on and engaging. This government organisation, located in Canberra, have an outstanding education department who provide a huge amount of resources for teachers. All their programs and resources are aligned to the Australian Curriculum. They even hold PD events if you are able to attend/participate. Their classroom resource section on the website is a great place to start. If your class is going to Canberra for camp, add the GeoScience Centre to your itinerary. It’s great fun and very hands-on. I had the fortune of visiting on camp with my class in 2015. The students certainly enjoyed making the seismograph move by jumping up and down with as much force as possible! 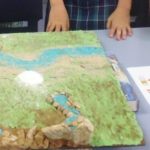 They also loved exploring the different kinds of rocks and gems found in Australia, and playing with different kinds of soil and other hands-on activities. As a teacher-geek BONUS, I managed to sift through the Centre’s collection of huge posters. I managed to take home quite a few to display in the classroom, just in time for our Earth Science unit. These were my favourite camp souvenirs, much to the dismay of my students. My name is Amy, and I am a Pinterest addict… Honestly, what did teachers do without it? If you’re looking for ideas to help you out with your Earth Science unit, look on Pinterest to see what other teachers are sharing and to find videos and gifs that may be helpful. I have put together quite a collection of ideas and resources on my Earth Science board on the Aussie Star Resource profile. Feel free to check it out and pin like crazy from there. You’ll no doubt see lots of these if you check out Pinterest, but I thought I’d share a couple that were successful with my Year 6 students. This was lots of fun and these little balls were a hit! (Too punny?) The printable resources you need are on the GeoScience website – Plate tectonics globe tennis ball activity. You will need to either buy cheap tennis balls from a $2 shop or ask students to bring one in from home. It’s best to warn them that they will be gluing paper on to the ball. It won’t be able to be used as a tennis ball again, so it’s probably not a good idea to bring a good brand name ball. Nor is your Mum’s prized ball signed by Roger Federer, after he won his gazillionth grand slam. By carefully cutting out the tectonic plates, students are able to arrange them to fit on the tennis ball and make a mini globe showing all the major plates. There’s also a template for a cute little stand so students can display their globe on their desks or at home. 20 litres of Water, a big plastic container, food colouring and 25 kids – what can go wrong, right? **Note – This activity needs some set up time so you may want to dedicate a double lesson. Check out the link in the title to get an idea of what this might look like. I have conducted this lesson with two activities. A. At the start of the lesson, we discuss what we know about tsunamis and our understanding of why they occur. Quite a few of my students believed they were only caused by meteorites like they are in the movies, so it is a good idea to address this early. At the front of the room I used a big plastic tub like you get at the bargain shops to put toys etc in. I chose to use a container that goes under the bed as it was wider and easier to use. Some people use a wooden ‘beach’ that they actually build, but seriously, who has the time? Instead of making something (or get my husband to) I asked two students to fill a bucket with sand from the sandpit and to build a beach. We then put Lego buildings and people on the beach. I coloured the water blue with food colouring to make it easier for the students to watch the movement from the side of the container. Pour it in gently at the non-beach end to avoid disrupting the beach too much. Here’s what it looks like when you’re done. It’s very effective. B. There are two ways you can make the wave: 1. You can bash the end of the tub (the end with the water) to create a wave movement with a heavy book or mallet; or, 2. You can place a board (a chopping board works well) in the water and as you tilt it upwards quickly it creates the wave. (check out the cute little guy in the video below). 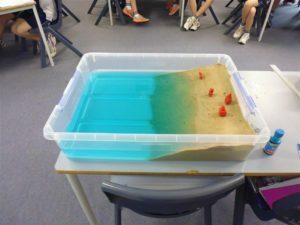 Both work well, but the board gives students a better idea of how the earth’s movement causes a tsunami. After we watched and discussed what we saw in the large tsunami demonstration the students used small clear takeaway containers and record their observations. In hindsight, I wish I’d thought of getting them to create and film their own tsunamis on the iPads. Then they would be able to slow the video down to watch the wave movement and the destruction on the beach. They could then have some fun adding music and voice overs. Surprisingly there wasn’t a great deal of mess to clean up as the students were so engrossed in what they were doing they didn’t create much mess at all. This topic lends itself to some really fun assessment tasks that go beyond the standard A2 poster board. At the end of each term I like to open a ‘Gallery’ in my classroom. The parents come in and the students tour them through their artwork and projects. 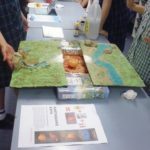 We studied Earth Science in Term 3 so in Week 10 on the last day of school after lunch we held an Earthquake Expo, and invited family, friends and the other classes in the junior school. It was a HUGE success and the students were very proud of their work. Here’s how it all happened. 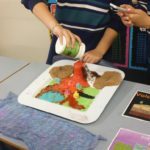 Create a presentation that demonstrates your knowledge and understanding of how sudden geological events can cause changes to the earth’s surface. Prepare a visual and oral component for your presentation – that is, you must be able to verbally explain it to your audience. You can create any kind of presentation you like, as long as it shows everything you know about how sudden geological events can cause changes to the earth’s surface. Work in pairs, groups of 3 or on your own. Carefully plan and prepare your presentation and receive feedback from the teacher. 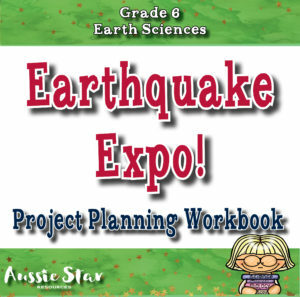 You will receive a project planning booklet and must complete it and present it at the Earthquake Expo with your presentation for the teacher to collect. It was so great to see the students create amazing presentations. 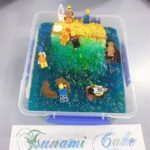 There were so many different kinds of presentations: A cake and jelly tsunami simulator with a well prepared oral presentation. A volcano placed on tectonic plates that when shaken created an eruption. 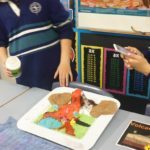 3D models of tectonic plates and the layers of the earth with amazing statistics. Mini documentaries and stop motion movies with sound effects and voice overs. They were incredible! We brainstormed lots of ideas as a class to help students choose something that worked with their strengths. This was one of the highlights of our year! Check out this gallery of the amazing creations that were on display. “Wait! This all sounds awesome, Amy, but how am I supposed to prepare all of this on top of everything else?” Don’t worry! I know how busy you are. I’ve been there and I know what it’s like to try and find the time to write up project descriptions and rubrics. 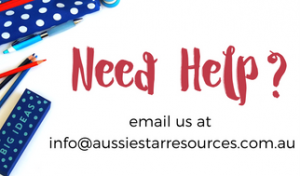 Aussie Star Resources have got you covered! Purchase our Earthquake Expo Project Planning Booklet for less than a cup of coffee in our TPT store. This booklet has 21 pages plus invitations/posters that can be sent home or displayed around the school. Hopefully you’ve found this helpful for planning your Earth Sciences unit. Remember — if you get stuck, Pinterest is a smorgasbord of ideas! The Separation of Powers doesn’t have to be confusing. When I hear the term Separation of Powers the first thing that comes to mind is a cartoon from my childhood called Shazzan! It was usually on around the same time as He-Man and She-Ra Princess of Power. If you know what I’m talking about, welcome, fellow child of the 80’s! If you don’t know what I’m on about, I’ll give you a brief rundown. In a nutshell, this cartoon was about two teenagers called Chuck and Nancy who found two rings, with each ring having a half of a symbol. Chuck and Nancy travelled around an Arabian country on a flying camel called Kaboobie. Like all good cartoon characters, they would find themselves in trouble and face grave danger. But when they joined the separate halves of the magical rings and said, “Shazzan,” a magical genie called Shazzan would appear and save the day. It’s a classic and I remember playing superhero games. My sister and I would pretend to join rings to give us superhero powers and beat the evil villain (our cat Pinky). Unfortunately, the Separation of Powers outlined in the Australian Constitution is nowhere near as fun and exciting. Flying around parliament house on a camel and asking a magical genie for help isn’t on the agenda (although I bet they sometimes wish they could ask a genie to sort it all out). The first three chapters of the Australian Constitution are dedicated to explaining the roles and responsibilities of the three arms of government – The Parliament, The Executive and The Judiciary. These three groups work together to govern Australia. They share the responsibility of making and implementing laws. The Separation of Powers makes sure that the government is always fair and accountable. Creating checks and balances on their use of power allows it to be challenged if necessary. What do you mean balances? If one arm of government has more power, then it would be impossible to make it accountable and to check its conduct. It could overrule the other two groups. The Constitution ensures that there’s not just one group running the whole show. Power is balanced between the three arms of government, and they must only use power as written in the Australian Constitution. Each of the three arms of Government checks on each other. The Constitution outlines systems and procedures which allow each arm of Government to review, evaluate and override the decisions made by the other two arms. Because each arm of Government knows it will be checked by the other two, it keeps them accountable and ensures that all decisions and actions they make follow the law. An important feature of Australia’s democratic system of government is the Rule of Law which ensures that we have a free, fair and democratic society. The separation of powers and the checks and balances they conduct are essential to maintaining the rule of law. It can be helpful to have an analogy, and while schools do not operate exactly like the government, there are similarities. The teaching staff– Teachers are basically the Parliament within the school. They make new rules (laws) and make changes to existing rules – so long as they are inline with the school policies (the Constitution). They also ensure that the rules are followed or in legal speak – they ensure that the students ‘follow the law’. The Deputy/Assistant Principal– The deputy leaders act as the ‘Governor General’ and Executive and must approve the rules made by the teachers and manage how the rules are upheld. They are in charge of the teachers and also deal with additional issues that come up regarding social, financial and environmental issues. The deputy leaders can only use their power as set out by the school policies (Constitution). The Principal– The Principal is the Judiciary and may operate on his/her own or with the assistance of a school board or governing council. The Principal can review and interpret the rules made by the teachers, as well as decisions made by the deputy principals, and provide an avenue for decisions to be challenged if necessary. Principals in Australia do not have the freedom to do whatever they want. Like teachers and deputy leaders, they must also operate within the school policies and guidelines. Within a school, there are checks and balances that occur through staff meeting discussion and the involvement of staff on governing councils. While the school Principal may be the ultimate leader, they work in conjunction with all the staff to run the school professionally and fairly, and within the policies and guidelines set by the school. But how do I teach such a dry topic to my students AND keep them engaged? Aussie Star Resources have a resource especially for this topic! 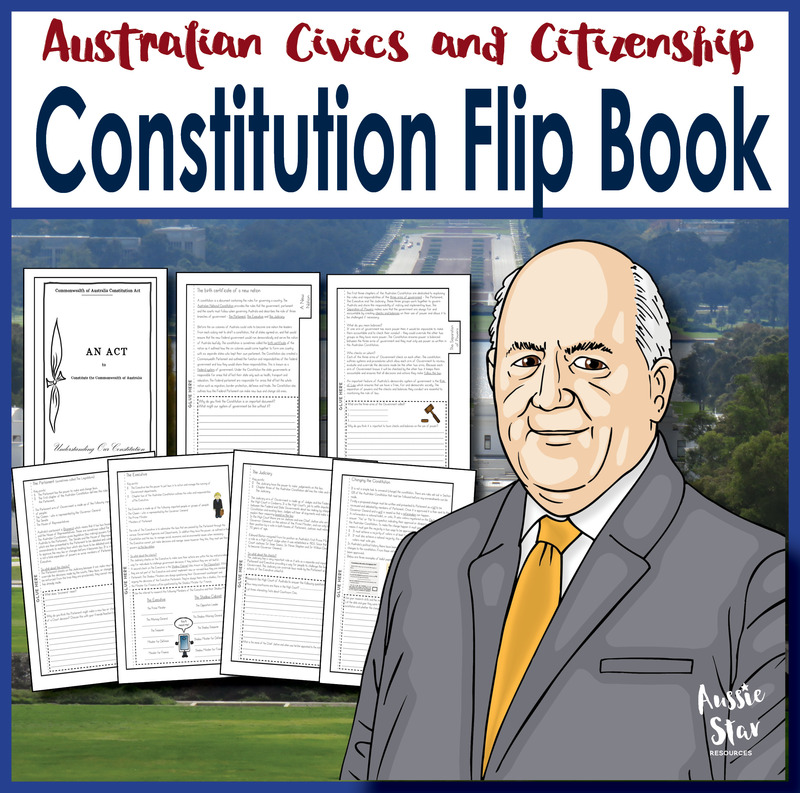 Our Year 6 HASS Civics and Citizenship – The Constitution and Separation of Powers flip book is a fun resource. This six-page flip book explains what the constitution is and breaks down the roles and responsibilities of each arm of Government. Use the flip book in one lesson or break up the pages and slowly build the flip book as your class study each arm. The choice is yours! I know how busy you are, so we’ve prepared it all for you – just print and go! www.peo.gov.au – this is the Parliamentary Education Office website and it’s a great place to find detailed explanations and further information. www.ruleoflaw.org.au – this site looks a bit heavy but there is an Education section that has some helpful resources. Role play can be another great way for students to gain an understanding of tricky concepts. Set up your classroom as a mini-government and separate the students into the three arms of Parliament, Executive and Judiciary. Assign each arm the roles of creating new rules, administering new rules and reviewing challenges to these new rules. It could generate quite a bit of debate and discussion about the benefits and restrictions of such a system. 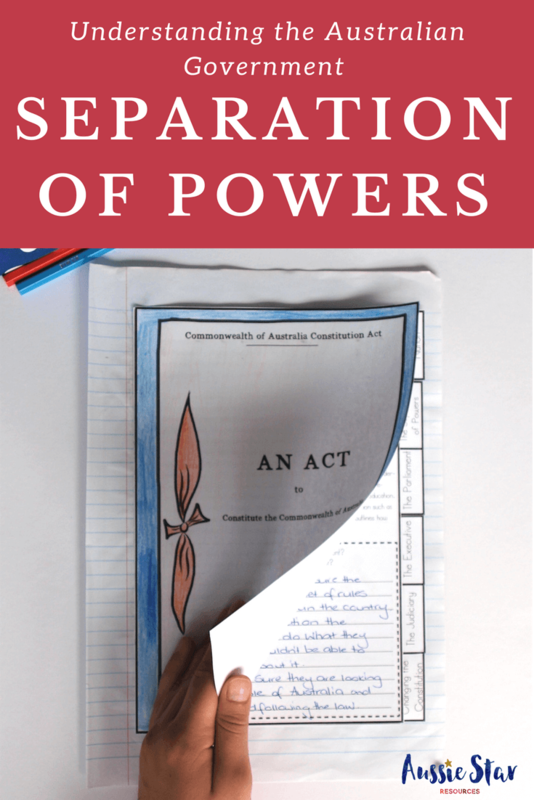 I hope this has helped you to understand the Separation of Powers and its important role in upholding Australia’s democratic system of Government. While it’s not nearly as exciting as magical rings and a genie who saves the day, it doesn’t have to be a daunting or arduous topic to teach.